Pain may move to the groin area (groin pain), testicles (testicle pain) in men, and labia (vaginal pain) in women. Testicle pain is discomfort in one or both testicles. The pain can spread into the lower abdomen. The health care provider will perform a physical exam. The belly area (abdomen) or back might feel sore. 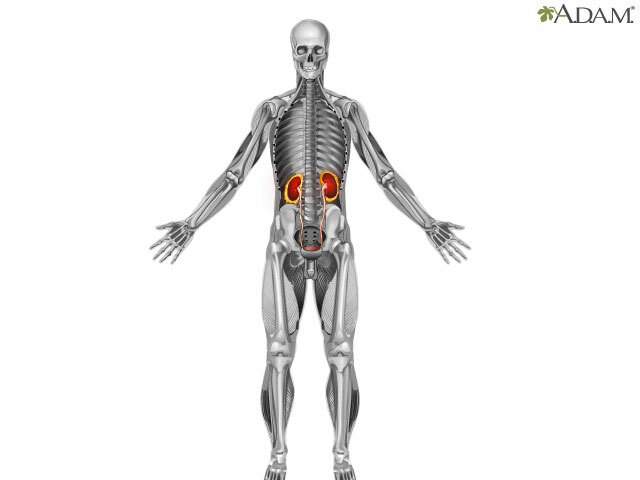 Some people with severe pain from kidney stones need to stay in the hospital. You may need to get fluids through an IV into your vein. Lithotripsy is used to remove stones slightly smaller than a half an inch (1.25 centimeters) that are located in the kidney or ureter. It uses sound or shock waves to break up stones into tiny fragments. Then, the stone fragments leave the body in the urine. It is also called extracorporeal shock-wave lithotripsy or ESWL. Procedures performed by passing a special instrument through a small surgical cut in your skin on your back and into your kidney or ureters are used for large stones, or when the kidneys or surrounding areas are incorrectly formed. The stone is removed with a tube (endoscope). 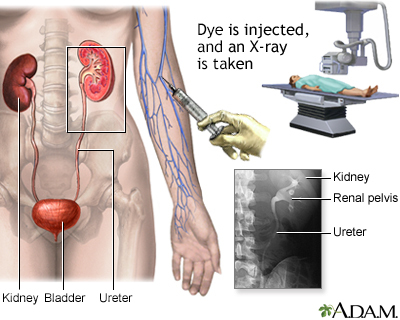 Ureteroscopy may be used for stones in the lower urinary tract. Rarely, open surgery (nephrolithotomy) may be needed if other methods do not work or are not possible. Talk to your provider about what treatment options may work for you. 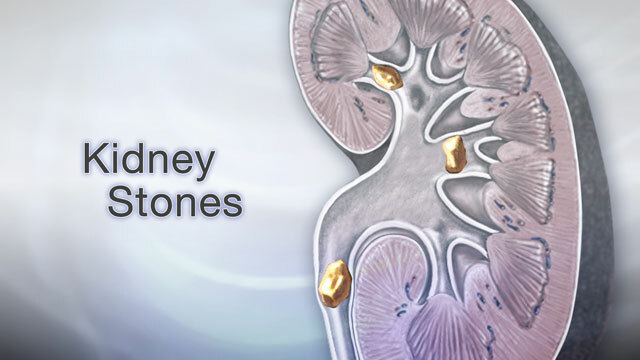 Kidney stones are painful but most of the time can be removed from the body without causing lasting damage. 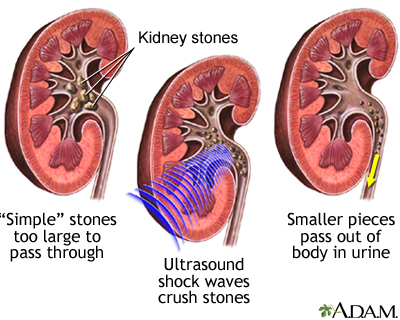 Kidney stones often come back. This occurs more often if the cause is not found and treated. 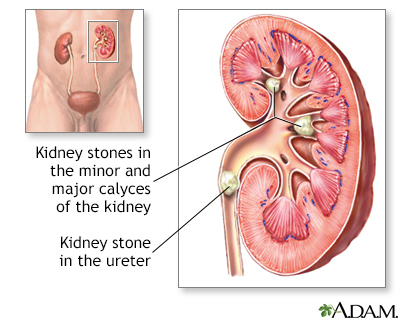 Complication of kidney stones may include the obstruction of the ureter (acute unilateral obstructive uropathy). If you have been diagnosed with blockage from a stone, passage must be confirmed either by capture in a strainer during urination or by follow-up x-ray. Being pain free does not confirm that the stone has passed. Drink plenty of fluids (6 to 8 glasses of water per day) to produce enough urine. You may need to take medicine or make changes to your diet for some types of stones. Your provider may want to do blood and urine tests to help determine the proper prevention steps. Fink HA, Wilt TJ, Eidman KE, et al. Recurrent nephrolithiasis in adults: comparative effectiveness of preventive medical strategies [Internet]. Rockville, MD. Agency for Healthcare Research and Quality (US) 2012; Report No. : 12-EHC049-EF. PMID: 22896859 www.ncbi.nlm.nih.gov/pubmed/22896859. Qaseem A, Dallas P, Forciea MA, Starkey M, Denberg TD; Clinical Guidelines Committee of the American College of Physicians. Dietary and pharmacologic management to prevent recurrent nephrolithiasis in adults: a clinical practice guideline from the American College of Physicians. Ann Intern Med. 2014;161(9):659-667. PMID: 25364887 www.ncbi.nlm.nih.gov/pubmed/25364887.